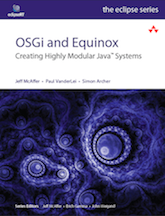 Equinox implements a wide array of standard OSGi services as well as many additional modules. To get started in a particular area, follow the related Getting Started Guide from the list below. Basic OSGi with Equinox -- Learn how to get, start and extend the Equinox implementation of the OSGi framework specification. Install bundles, start and stop them, and interact with the OSGi console. Embed a server in Equinox -- Define bundles that supply servlets, JSPs and resources and then run them in Equinox using HTTP servers embedded in Equinox. Embed Equinox in an existing servlet container -- Define bundles that supply servlets, JSPs and resources and then run them in Equinox but this time with Equinox bridged to a standard app server.